Properties in Washington average 4.7 out of 5 stars. Property 53: Pet-Friendly Home 10 Minutes to Downtown Spokane! Cozy, contemporary cabin near skiing, lifts, mountain lakes, and more! Property 54: Cozy, contemporary cabin near skiing, lifts, mountain lakes, and more! Property 66: The Taste of Home in Packwood! Property 67: Spacious house, easy access from Seatac, Seattle & Bellevue. Property 74: "Beach Harmony" In Moclips-Pet Friendly And Just Steps From The Quiet Beach. Property 75: Neil Bay Waterfront Family And Pet Friendly Property! Perfect, Quiet Retreat: Park like Setting w/ Big Yard - Great location to I-5! Property 76: Perfect, Quiet Retreat: Park like Setting w/ Big Yard - Great location to I-5! Come to the Nest! It's better than the rest. Hot Tub! Wood Stove! Property 77: Come to the Nest! It's better than the rest. Hot Tub! Wood Stove! Perfect for couples and those that want to be! Property 78: Perfect for couples and those that want to be! 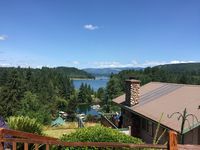 Property 81: Spectacular lake view! Property 83: Beautiful cottage in the heart of the city! Property 93: BREATHTAKING Puget Sound Views! Water front property with spectacular views. Property 94: Water front property with spectacular views. Views of Lake Washington and Mt. Rainier- North Seattle Area. Superb Location! Property 95: Views of Lake Washington and Mt. Rainier- North Seattle Area. Superb Location! Property 98: The Jewel on Newell - Just steps to Downtown Walla Walla! Property 99: OCEAN FRONT - "right on the beach...a great place to stay"
Place is excellent! View is incredible! Interior decorating of cabin is excellent! The owner, Rindi, is wonderful and keeps you current and stays in contact. The beds were extremely comfortable! The kitchen facilities was fantastic! The dining room table was a great focus for our group. All I can say is WOW!